Back in the 90s, I worked at an animal shelter, and the cat wing was full of cats surrendered because they “didn’t use the litter box,” “cat inappropriate elimination” or “missing the litter box.” It always broke my heart that these family cats were being turned into a cat rescue or animal shelter for litter box issues. I kept thinking there had to be an explanation and more importantly, a solution, for these beloved pets. According to the ASPCA “of the cats entering shelters, approximately 37% are adopted, 41% are euthanized, and less than 5% of cats who came in as strays are returned to their owners.” That is a sad statistic. When I’m working with a cat or dog behavior case, the very first road I take with my clients is medical. We have to make sure a cat or dog’s behavioral problems are not linked to something medical. If we don’t solve an underlying medical condition, the behavioral problem will never be resolved. And sometimes finding a medical reason for not using the litter box can be challenging. Clients often tell me that their vet said nothing was wrong with the cat medically – that it was all behavioral. I respect veterinarians, but sometimes there is a disconnect between the cat client and their veterinarian on the importance of the issue and what the client is willing to test. A urinalysis is a great start but is not guaranteed to find all medical reasons why your cat isn’t using the litter box. Hearing Dr. Morgan talk about a cat’s diet and how once again, diet can make or break an animal just validates my thoughts on a home prepared or raw diet for my pets. There just never seems to be anything good about a highly-processed pet food. But I digress. Before you start to think of a cat’s inappropriate litter routine behaviorally, please work with your veterinarian to ensure your cat’s litter box issues are stemming from a medical condition. This should be treated first. After his medical condition is treated, then it’s time to look at behavioral reasons. 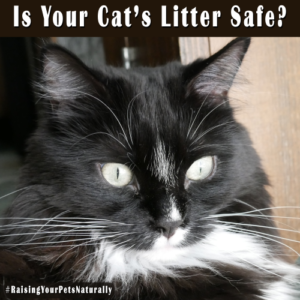 And don’t forget to read my article: Is Your Cat’s Litter Safe? 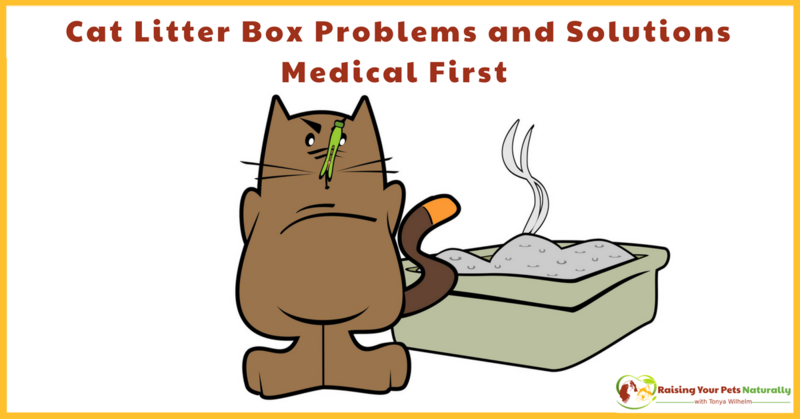 Have you dealt with litter box problems in the past? Tell me in the comments. We don’t have cats, so we don’t really know this problem. However, have had a couple family members go through it. Will pass your post on! I remember when I worked with our vet, we used to see a lot of arthritic cats and it happened to be their litter box – too high off the ground or squatting was painful. Not something all that obvious to the owners of course. Love your advice to rule out medical concerns. Thanks, Christycaplan. And thank, you for what you do. 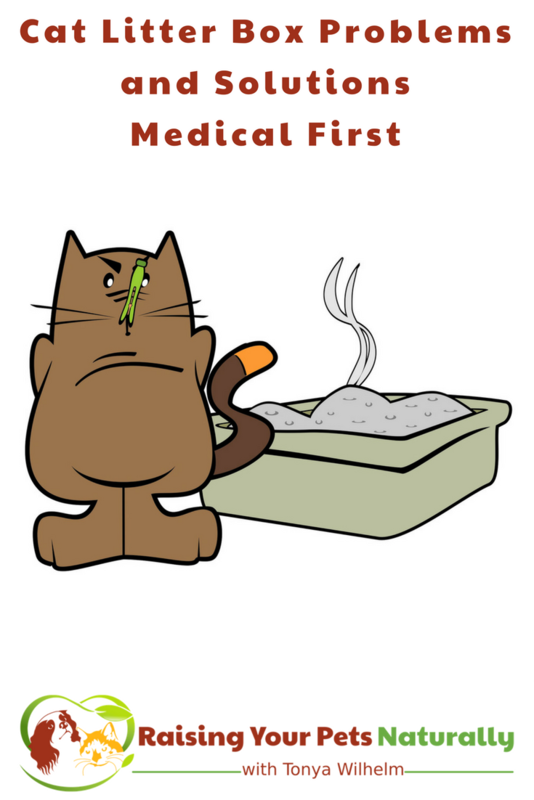 There can be lots of reasons why cats don’t use the litterbox and it’s important to rule out medical issues in the first instance – thanks for an informative post. Thanks! It sure can be a lot of digging to find the right reasons and solutions. But they are so worth it. I have worked in a shelter, too, and know how common this problem is. So many cats are surrendered for litter box issues. Our 18 year old cat has some accidents though she does try and make it to the box. I have been leaving puppy pads out near the box and she will often use them. Not ideal, but better than directly on the floor. Her issues are related to arthritis and kidney issues. She is currently in hospice care and we know is trying her very best. I use to have 4 cats… I must admit litter is one thing I don’t miss! Those were staggering statistics!! I would guess that litterbox use issues are probably HUGE in terms of cats getting sent to shelters or rescues!! As a dog trainer, it’s always sad to me to see how few people want to solve their pet’s issues, and instead just choose to find a new pet. Thanks, Sally. I know, it’s awful. I’ve been a dog trainer for almost 20 years, and some people just don’t want to put in any effort. Thank goodness that’s not always the case. When there is a problem, I always say to look for medical reason(s) first. The humans always start with a visit to the vet if any of the Tribe of Five have litter box problems. 🙂 Vets are amazing resources and always my first trip. It is so heartbreaking that people surrender their cats simply because of a litter box issue. Don’t they realize the severe consequences that can go along with that? There often is a medical problem or simply a diet that needs to be changed, if people would only take the time to find out. Great post, sharing. Thanks. I don’t know why people think that if they surrender their pets they will have a better life. Granted, sometimes that is the case, but pets are family and not disposable! Thanks for the great post. We don’t have any problems here but mom says when she was a foster she saw lots of kitties surrendered for litter box issues. So sad. Sure thing. And thank your Mom for fostering! this is great. my sister was just asking me why her cat isn’t using the litter box. Gonna share this with her. Thanks! I hope she figures out how to help her kitty. I’m here if she needs additional help. Thanks for the informative post! Litter box issues can be very problematic. :/ But giving up your kitty because of it would be just heartbreaking! I know a few people who would benefit from this article… I’ll share! Thanks, Michaela. My goal is to help keep everyone in their homes! I’ve been lucky with my cats in that they’ve always used the litter box. So sweet. I’ve had two different cats (one was my Persian) with medical litter box issues. It is amazing how little perseverance people have in figuring out why their cat isn’t using the litter box. A lot of the things that people do for their convenience cause cats to stop using the litter box – declawing, feeding dry food, moving litter boxes around, etc. Your point about diabetes and aging is excellent! So many times, the problem is not a bladder infection. Absolutely! We can cause the problems, then decide our pets aren’t worth the effort to try to change the behavior or live with it. Terrible. Great post and I had 3 cats when living in Israel but thank goodness never had that problem. I HAVE heard the terrifying sttistic about cats and litterboxes. People are both ignorant and impatient. What the heck is it with them? Would you return your child to the hospital because he has medical issues (as if!!!) It takes a bit of patience, and research and books like yours to teach people it’s often NOT the cat’s fault! Thanks for the comment. Patience for sure. I’m so tired of people wanting to fix their problems in a minute. Really! Yes, medical reasons need to be ruled out for training issues with both dogs and cats! I will pin this post and share with a coworker. I tried to explain the act might be medical as apposed to behavioral. Thanks for this post! Super! Thanks. I hope it helps her. Great point to always check for health issues when you get behavioural issues in either cats or dogs. My cat Nala started peeing on a white rug suddenly at age 17 and it was because she had kidney disease and wanted to show me. Oh, sweet Nala. <3 Thanks for sharing. I guess a lot of people think it is a behavior issue instead of a medical one. Hopefully, this helps gets some cats to the vet to receive the medical help they need. Thanks. It’s so important to have a good vet visit to rule out medical conditions. Especially if it’s a new behavior and the environment is the same. Very helpful info, and above all I think it’s important that we make all our cats environments as pleasant as possible. Agree! Thanks for your comment. As a dog mom, I have a lot of friends who are cat moms, too. I have heard of this brand and I will absolutely share with my cat parent friends. It looks like a good option! Thanks, Carol. I appreciate that. Thank you for sharing such important information! It breaks our hearts when cats are surrendered to a shelter because of litter box problems. Sometimes it just takes a little patience and a trip to the vet! I know, Lola. I’d put a diaper on my cat before surrendering him! Oh no! That is so sad that a lot of cats are surrendered due to litter box issues. I did not know that. Hopefully posts like this will help eliminate that some. I will share! Thanks, Kia. I appreciate it. I just want these kitties to be able to stay in their homes. Thank you for all this great info. We have a now-rehabilitated feral we vetted and adopted, but he is still very leary of being picked up and truly prefers to be outdoors, but I sure do know a lot of other kitty moms that I’ll be sharing this with! Also will be Pinning on my “Mews News” Pinterest board! Congrats on your feral. That can be a lot of work. THanks for sharing. Good to know, it’s so easy to train a cat to use a litter box, it’s second nature – sorry to hear that changes can be caused by painful conditions! Thank you Lindsay. Unfortunately, some cats are trickier than others.